Patient burns resulting from the misconnection of a “flying lead” bipolar electrosurgical cable should be a thing of the past. For decades, ECRI Institute and other organizations have warned about the misconnection and burn risk. In addition, safety and standards organizations have long recommended that flying lead cables be phased out; and bipolar cables that prevent such misconnections are commonly available. Nevertheless, flying lead cables remain in use, and ECRI Institute continues to receive reports of misconnections resulting in patient injuries. What do you need to know about the hazard, and what steps can you take to prevent patient harm? “Flying lead” bipolar electrosurgical cables are bifurcated at the plug end with two separate connectors. Each connector is intended to be inserted into one of the two bipolar electrode jacks on general-purpose electrosurgical units (ESUs). However, the physical separation of these connectors—because they have flying leads—allows them to be inappropriately inserted into the wrong electrode jacks on the ESU (see the figure on p.29). 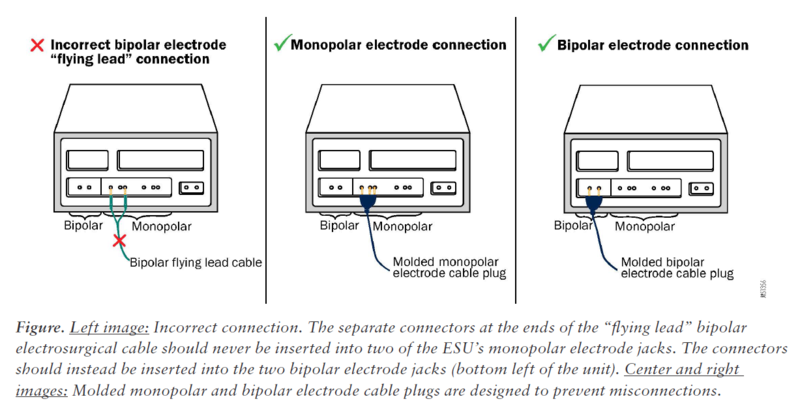 When a bipolar electrode is wrongly connected to the monopolar jacks on an ESU, the generator may, under certain circumstances (as detailed below), activate without intervention from the surgeon. This unintended activation will deliver monopolar output current through the bipolar electrode to the monopolar return electrode in contact with the patient. Further, the monopolar output may be an inappropriate waveform and/or power setting for the intended bipolar procedure. Such inadvertent ESU activation can lead to unintentional patient burns or other injury (e.g., bowel perforation). The flying lead cable design has been warned against in recognized device standards as far back as 1993. ANSI/AAMI/IEC 60601-2-2:2017—and versions dating back to 2006—specifically prohibits flying lead cables because of the possibility of misconnection of a bipolar accessory to a monopolar output, which could lead to patient injury. Cost is one reason that, despite the risk, healthcare facilities may persist in the use of bipolar electrodes with flying lead bipolar cables. ECRI Institute PriceGuide data confirms that bipolar cables with molded plugs can be 2% to 16% more expensive than electrodes with flying lead cables, depending on the supplier. 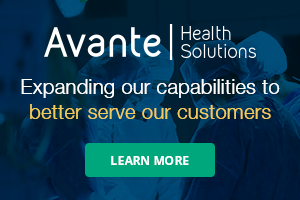 However, analyses of purchase costs don’t factor in the expense of an adverse incident. The cost of a single burn-related claim may significantly outweigh the added expense of molded plugs; burn litigation payouts can be in the hundreds of thousands of dollars. Another reason that flying lead cables remain available is the continued use of some older, specialized bipolar ESUs that require the use of these cables. Such units (e.g., surgeon-preference generators for neurological applications) do not feature the standard bipolar-jack spacing found on most modern ESUs. Monopolar output sockets have three unevenly spaced banana jacks in a straight horizontal line to accommodate the three banana pins of the molded monopolar electrode cable plug. (One jack is for the active electrosurgical current and the other jacks are for switching between cut and coagulation modes when the surgeon presses the appropriate button on the active electrode pencil.) The fixed, uneven spacing of the pins prevents this molded plug from being installed upside down or in the bipolar output socket. The bipolar output socket, on the other hand, has two banana jacks in a horizontal line that accommodate two bipolar electrode banana pins; these may be from a molded bipolar electrode cable plug or from flying lead cables. Because the banana pins on flying lead cables have no orientation or spacing constraints, they can be easily inserted into any two of the three monopolar jacks. Further, because many ESUs have two monopolar sockets, the potential for misconnection remains even if one of the monopolar sockets is occupied by a molded electrode cable plug. When one of the banana pins of a bipolar flying lead cable is mistakenly plugged into one of the cut or coagulation mode jacks and the other is plugged into the active current jack, monopolar current may be delivered through the bipolar instrument when its tips touch or when it closes around tissue with a low enough impedance to conduct the electrosurgical current. In these circumstances, if a return electrode is plugged into the generator and in contact with the patient, as is typical for monopolar operation, the ESU will detect a completed monopolar patient circuit and may inadvertently activate. The surest way to prevent this problem is to discard disposable and reusable bipolar electrodes with flying lead cables and replace them only with bipolar electrode cables that have a molded plug. These cables cannot be plugged into monopolar output sockets. Segregate them and their flying lead cables from any monopolar or monopolar/bipolar general-purpose ESUs so that their cables cannot be accidentally misconnected. Do not use these specialty bipolar units if there is an alternative energy source that can perform the same function. Plan for the replacement and retirement of units that require flying lead cables. After retiring the units, discard any reusable or disposable flying lead cables that have been purchased for use with them. Regardless of the type of ESU used, always be aware of the specific tones and indicators associated with activation of particular ESU outputs (e.g., cut, coag, bipolar). For additional details, refer to ECRI Institute’s full report at bit.ly/FlyingLead. The organization has made the report available to the public as part of its effort to keep the healthcare community informed about this potential hazard. To learn more about Health Devices membership, contact ECRI Institute by telephone at (610) 825-6000, ext. 5891, or by email at clientservices@ecri.org.